This is my 1971/72 Heuer Camaro ref. 73445. I'm not normally a big fan of golden watches, and this baby is gold plated, but it has grown to me. 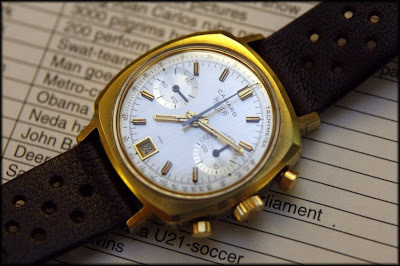 I have learned to like this all original Heuer. The condition is very nice for a gold plated watch. There's no wear to the plating, just an nice overall patina. Dial and hands is also in perfect condition. 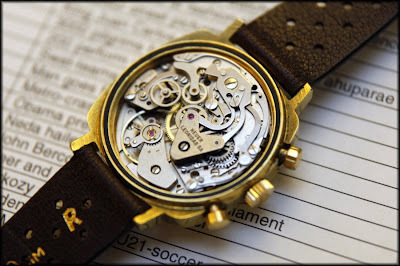 The movement is a Valjoux 7734 with a bridge signed HEUER LEONIDAS S.A. The inside of the case back is also signed with the same name. Earlier ref. numbers had Valjoux 92, and Valjoux 7730. The three register Camaro had Valjoux 72 and later Valjoux 7736. 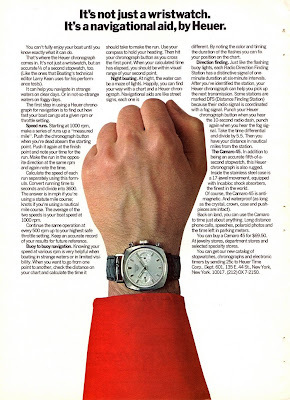 This watch even has the very rare original two piece bracelet from NSA in Heuer Monaco style. This is the only Camaro I have seen with this bracelet. 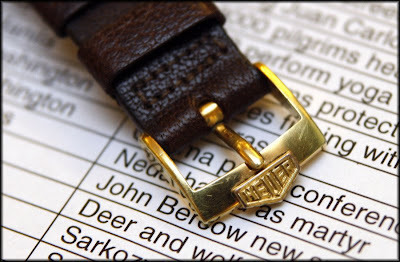 I also have a period vintage brown rally strap with a genuine vintage Heuer gold buckle. The buckle has the sun symbol on the inside, a proof for a genuine vintage buckle and not a re-issue. 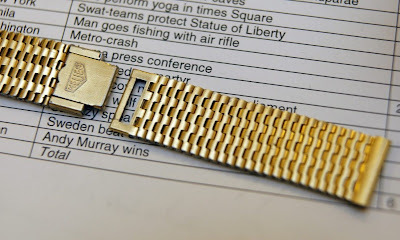 NSA bracelet in Monaco style. 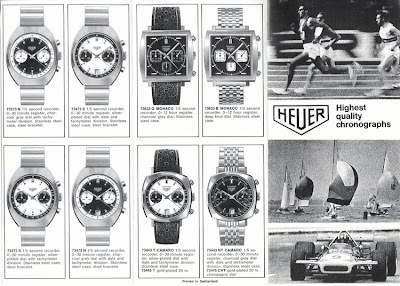 Heuer 1971/72 catalogue with the two register Valjoux 7734 driven Camaros.